Our Professional Plan starting at only $7.03 per month. Includes your own local area code fax number with unlimited fax reception. Select a number from one of many countries. Includes free sending of up to 20 free pages (to zone 1 destinations, other zones less) each month! If you need to send more than 240 pages per year, send them using our discounted rates for Pro Plan users. Click here to see our special low rates for Pro Plan users. Using PamFax in a business? Use the free PamFax Company Manager to manage all users in your business. 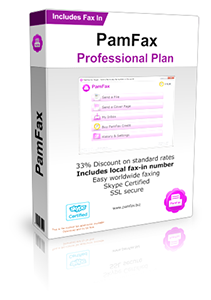 Allocate PamFax Credit, access faxes and share incoming faxes.